Bring your Guardian Angel to your Bingo Hall with this cushion. 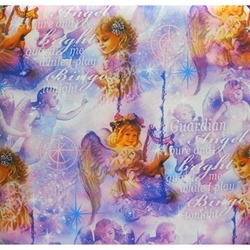 Images of various angels amongst the stars and clouds decorate this pattern. The poem amongst the angels says, "Guardian angel pure and bright, guard me while I play Bingo tonight". This double seat cushion has a seat flap on the back. The foam inserts in this double cushion are roughly three inches thick. There is a handle on both ends of the cushion for ease of carrying. Each cushion measures 13x13.5x3". Two of these are fashioned together by 2.5" of patterned fabric.